Which pastimes and hobbies do Amish enjoy? Amish recreation spans a wide range of activities. Typical pastimes include birdwatching, visiting family, friends and church members, attending various types of auctions, work “bees” and so-called “frolics” which offer an avenue for social time along with productive work, hunting, fishing, cycling, and some sports such as volleyball and softball. The acceptability and popularity of recreational activities will vary by church and settlement. Read more. Do Amish ride bicycles? Many do, though in some cases the kick scooter is used in churches where the Ordnung does not permit bicycle ownership. These communities include the bulk of the Lancaster County settlement as well as Swiss Amish communities (limited bicycle use has been reported in Lancaster County). Some Amish operate bicycle shops in areas where its use is common, such as this shop in Holmes County, Ohio. Bicycles are a popular form of both recreation and transportation in some communities. In addition to traditional bicycles, some Amish ride recumbent models. 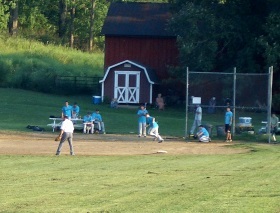 Baseball and softball are popular among the Amish. Holmes County, Ohio. Do Amish play sports? Youth and children frequently participate in sports including softball, hockey, volleyball, basketball and others. The popularity of a given sport varies across different communities. Basketball, for example, is popular in Indiana settlements, while hockey thrives in the Lancaster County area. Other sports and games include cornerball, croquet, and for Amish visitors and residents of Florida’s Pinecraft community, shuffleboard. Adult participation in sports is less widely-accepted though some baptized adults also play on teams, and may sometimes “help” children and youth in their games, including softball, volleyball, and hockey. Not all Amish support participation in sports and games. Read more. Do Amish go hunting? Many Amish are avid hunters, to the point that some within the community have spoken against over-indulging in this pastime. While many Amish see little harm in hunting and eating what one kills, some have criticized the practices of trophy and big game hunting, which often involves great expense and travel. Amish hunt with both firearms and bows. In some cases Amish females may participate in hunting. Read more. Some Amish ride horses. Branch County, Michigan. Do Amish ride horseback? 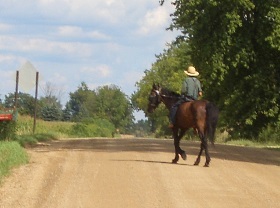 Riding horseback is not common, but some Amish do, for recreation and in some cases short-distance transportation. In The Riddle of Amish Culture, Donald Kraybill writes that the practices “generally discouraged because it borders on a worldly form of sport” (Riddle, p. 70). More likely to be seen among younger Amish people. Stoll, Elmo. “Why I See Danger in Games and Sports”. Family Life (March 1982):9-12. To Cite this Page: Wesner, Erik J. 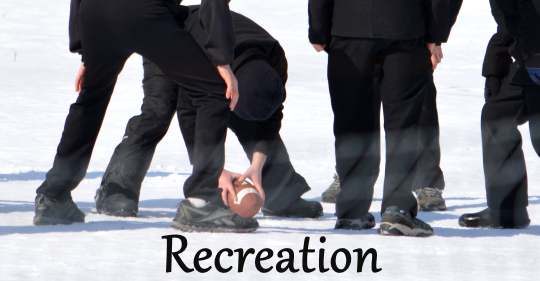 “Recreation.” Amish America. Erik Wesner, 8 Apr. 2015. Web. [Date Accessed]. <http://amishamerica.com/recreation/>.